Despite a good beginning, 2015 turned out to be slightly less favourable for retail than it had been expected. Although the market developed, its growth dynamics were lower, and market saturation increased considerably. 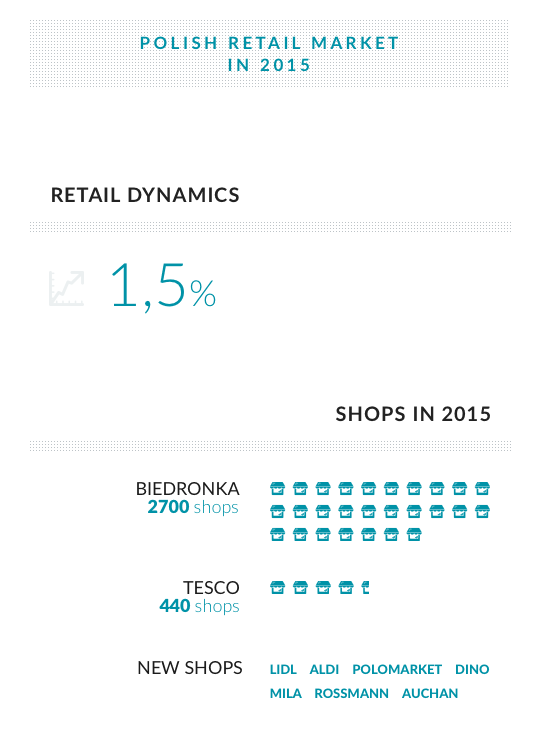 According to the data published by the Rzeczpospolita daily, last year’s retail dynamics amounted to only 1.5%. Still in 2013 Jeronimo Martins said that it would have 3,000 Biedronka stores by the end of 2015, yet the rate of expansion decreased and now there are nearly 2,700 Biedronka stores. And the number of Tesco stores was reduced in a year by 9 to 440 outlets. Even though new stores are still being opened (new stores were opened last year by Lidl, Aldi, POLOmarket, Dino, a new brand Mila, Rossmann drugstore chain, or Auchan), it seems that the stage of intensive organic growth is coming to an end just now and that chains will have to compete with each other in different ways. The market of shopping malls is also more and more saturated. According to JLL, in 2015 the biggest growth in retail space was recorded since 2009. Over 500,000 sqm were commissioned, while in 2014 it was 332,000 sqm. Another prominent trend last year was the modernisation and extension of the existing facilities. The data of JLL shows that at the end of 2015 total size of modern retail space was 13 million sqm, and market saturation reached 241 sqm per thousand inhabitants. Such a result is much above the EU average, which amounts to 202 sqm, but we are still below the Western European average, which approximates 262 sqm per thousand inhabitants. Smartphone owners may choose from a broad selection of apps presenting promotional brochures of many retail chains. The chains themselves also implement their own solutions. Lidl, Tesco, Biedronka, Polomarket, and Carrefour have already launched their own apps. Smartphones have become an important tool in the hands of consumers. They are used also during shopping, e.g. to take photos of products in order to compare the offer of various stores and to check and compare the prices of specific goods on the Internet. It is also important that consumers equipped with tablets and smartphones provide data on their shopping habits themselves. Also shopping malls benefit from technological development as they install the so-called beacons, i.e. 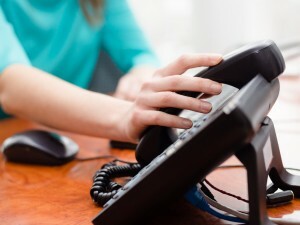 monitoring devices that use the data from the customers’ smartphones. The collected information is used for example to generate customised messages for customers, taking into account their preferences or their location at the moment. 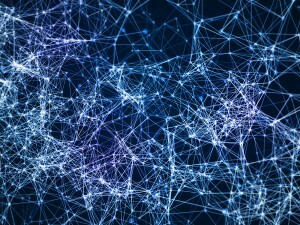 Analysing the communication of many retail chain brands, we can see that many of them focus now on maximum customer satisfaction, which translates into the loyalty of consumers and the size of their shopping carts.However, building loyalty is a long-term process which requires well though-out and systematic actions, regular communication with the customers among others. What is more, shopping decisions are influenced not only by rational factors, but also emotional ones, and according to many studies the final choice is often made directly in front of the shop shelf. Therefore proper arrangement of retail space is another key to success. Chains try to organise their commercial space in order to make shopping both convenient and attractive, which requires applying more and more advanced Visual Merchandising solutions. We can mention here for example brand areas, where shoppers may see additional advertising materials, watch a short promotional video, or even try the product.At present, a whole range of such practices is being tested in selected Tesco hypermarkets, and the project is being implemented in close cooperation with suppliers. Consumers expect nowadays that new technologies will make their shopping easier. Also retail chains expect synergy between traditional and virtual channels. The experience of Western European countries shows that in the long term omnichannel retail is a good method of increasing both customer loyalty and sales. The option with exceptionally high potential is ‘clik&collect’ shopping, when consumers shop online, and then collect their purchases on their own from the store. Many retail chains have been operating both in the real and virtual worlds for several years already. These include Tesco, Auchan, Alma, Piotr i Paweł in the food sector, Leroy Merlin in the DIY sector, or Euro RTV AGD and Media Markt electro stores. In 2015, Intermarché and Bricomarché announced the launch of an online store. E-commerce accounts for up to 4-5% of the value of Polish retail, and its growth is not interrupted, even though traditional retail is slowing down. Online trade has attracted many customers in such market segments as home appliances or radio and TV equipment, where the market seems to be highly saturated. Internet players are also conquering the clothes, cosmetics and interior design accessories markets. There is still room for new entities in the food segment or children’s products, though. Now, the dominant feature of the e-commerce market is its fragmentation, which will probably lead to consolidation and takeover of smaller players by e-commerce leaders in the future. M-commerce has so far accounted for a small share of the Internet cake. Its growth dynamics are also lower than that of e-commerce. 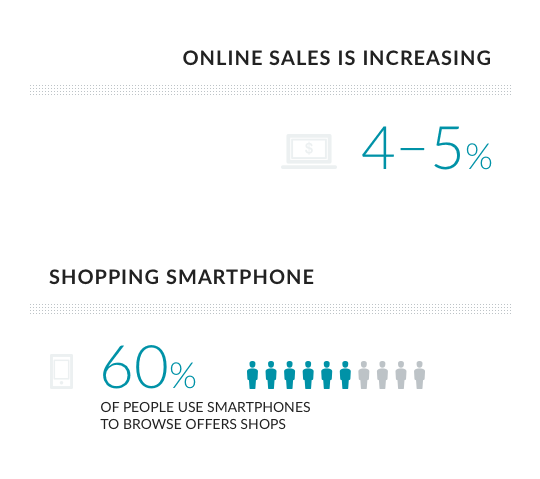 Despite over 60% market penetration by smartphones, there are many obstacles to using them for shopping. One of the main obstacles is that online stores are not adjusted to mobile shopping, which makes shopping there with a smartphone difficult, or often even impossible. Moreover, some smartphone users are anxious about the security of transactions made with them, so even if they view products on their smartphones they prefer to finalise the purchase using their PC. Mobile technologies will certainly develop, but their development will always be limited by the key feature of smartphones, e.g. their smaller screen surface. 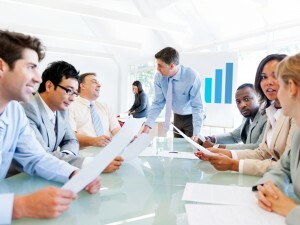 Inquiry Market Research offers research services across all Central and Eastern European markets. We are happy to share our experience with you and help you find the best research methods for your projects in CEE. Inquiry Market Research is an independent research agency based in Warsaw, Poland. We specialize in both qualitative and quantitative research services across all Eastern European markets, including Poland, Czech Republic, Slovakia, Russia and many more. How is market research done in Central and Eastern Europe? © Inquiry · Built with love by Inquiry.